a Formula One car and the performance of a Pontiac GTO. 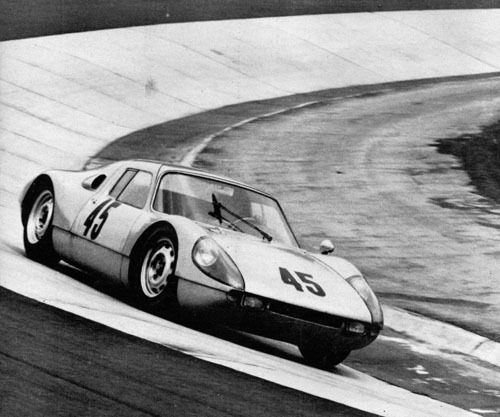 Our formal introduction to the Porsche 904 should have been a disappointment. We were given the third 904 ever built, an ancient factory prototype that had been a mechanical guinea pig for the engineering department. It was spottily painted a dull, military shade of khaki, with virgin (if sullied) fiberglass showing through in places. It looked like some kind of crazy, knee-high reconnaissance vehicle that had failed its tests at the Aberdeen proving grounds. What obviously should have been a museum piece was to be our test car. Baron Huschke von Hanstein, Porsche's racing-, press-, and public relations-manager, was apologetic. Despite the fact that 904s were being turned out at the rate of almost one-a-day, eager customers were snapping them up at a pace production facilities couldn't match. We grandly waved aside his reservations; after all, if a lowly farm tractor had been good enough for von Hanstein's decampment from East Germany many years ago. Any 904 was better than no 904 at all. Starting our check-out procedure, the good Baron popped easily into the low slung coupe and beckoned us to follow. He's a very lithe fellow for his 53 years. The doors run the full height of the car-even curving into the roof-but opening them reveals a foot-high chassis side rail that blocks off about a third of the aperture. With practice, getting in and out can be done quickly but never gracefully. As we banged, popped and stuttered toward the factory's heavily guarded exit, we had a chance to mentally review our notes on the car. Technically, there is little novelty in the 904. Except for the chassis and body it is basically an amalgam of everything the factory has learned from racing Spyders, Carreras and single seaters. The chassis, which merely ties all the bits together, is a simple rail job. No space frames, no unit-body or monocoque construction-just a pair of deep, moreor-less box section rails that might be straight out of Frank Kurtis' design book. There are a few stamped indentations and cross-braces, but to the Sunday-supplement engineer's eye, it looks remarkably limber. The body was designed by chassis engineer Schroeder and Ferdinand Porsche, Jr. (grandson of the late Dr. Ferdinand). It appeals to one's baser instincts rather than to one's aesthetic sense. There have been dark rumors that its aerodynamics and top speed are improved by leaving the detachable rear body section at home, and as for originality, it shows the influence of Carlo Abarth's 1958 designs for Porsche. The factory claims the body-which is bonded directly to the frame rails-lends structural strength to the chassis. It is made of an ersatz fiberglass (called Pantal) by the BASF firm in Ludwigshafen and moulded by the Heinkel works. It feels rough and heavy by comparison to its more sophisticated American and English counterparts and seems to shred easily in minor racing shunts. 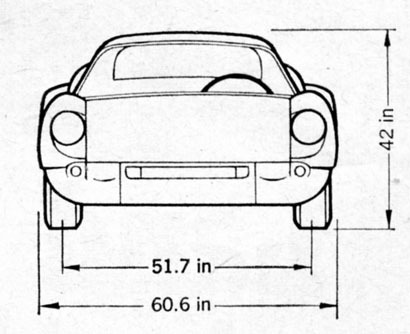 Difficulties in controlling wall thickness are blamed far the 904s' excessive weight at Sebring where the heaviest example weighed 1710 lbs; the factory now promises a delivered weight of under 1540 lbs. As far as the FIA is concerned, it could weigh as little as 1360 lbs before it would be under its homologated weight less the allowable 5%. Alternate bodies are permissible. . . anyone care to. try an aluminum-bodied roadster? The exterior finish (silver - other colours on request) is good and our argument about chassis flexibility is shaken to pieces by one empirical spin around the black-it rides as solidly as a tree stump. The engine is the tried-and-true Porsche two-liter, air-cooled flat-four with four overhead cams. (Incidentally, they've dropped all that mystique about chrome-plated bores and roIler bearings in favour of sprayed-steel liners in aluminum cylinders and plain bearings for con-rods and mains, like the Super 90 and 356SC.) Far the first time since the original series of 50 Porsches were built in Austria, the engine is ahead of the axle in a Porsche productian car. Basically the same powerplant as the late-model Spyder and Carrera 2 engines, it is rated at 180 bhp at 7200 rpm with 144.5 lbs/ft of torque at 5000 rpm by the conservative DIN system. This engine differs from previous Porsche two-liters in having wilder 'cams, bigger valves and mare fin area. Detuned far street use (with air cleaners and muffler) it produces 155 DIN bhp at 6900 rpm and 124 lbs/ft of torque, again at 5000 rpm. There just happens to be room in the 904's engine bay far anything up to an aluminum 377 Chevy V-8, though experimentation thus far has been confined to a two-liter version of the Formula One car's flateight, Ward around the back room is that the flateight is falling from favour, and that eventuaIly the 901's flat-six-tuned to over 190 bhp-will be available in the 904. The suspension is nearly identical in geometry and dynamics to. the last (1962) Porsche Grand Prix cars, though same changes have been dictated by the sports car's different characteristics, and far easier "mass" production. It consists af a conventional double wish~bone system front suspension and a complicated fourlink rear suspension-both with telescopic shacks and coil springs. There's not a torsion bar in sight, save for the front and rear anti-roIlbars. AIl the struts are tubular steel fabrications, while the front uprights are forged and the rear hub carriers are cast in light alloy. The rear suspension employs two long trailing arms, a reversed upper wishbone and a slightly-trailing lower link. Light alloy trailing arms are optional. Single universal joints are used as the outboard ends of the open halfshafts; the inboard ends have two sets of U-joints that give a "double knee action" to accommodate small changes in track. This ingenious and positive system does what sliding splines and Metalastik joints do for other cars (though it would not be suitable for anything as powerful as a Cobra, for example). Unlike the 356C Porsches, the 904's suspension system is lubricated-for-life except for the leading ends (Heim joints) of the rear trailing arms. The steering is a new-to-Porsche rack-and-pinion design from ZF (prefiguring the 901's steering) while the brakes are Dunlop-Ate four-wheel discs, mounted outboard. Like the 356C, the rear brakes have a small drum within the disc hub, to be used as an emergency or parking brake. The gearbox is really the newest-and one of the best-features of the car (and, again, prefigures the 901's almost-identical transmission). It is a five-speed all-synchromesh unit, using the justly-famous Porsche synchro system, in a new casing with a host of improvements over the Spyders' five-speed. (The old five-speed, never used in a production car, was basically the 356's four-speed with first in place of reverse and reverse hung off the nose piece in an auxiliary case.) A ZF earn-type limited slip differential is standard equipment on the 904, as is a 4.428-to-one ring and pinion. Sixteen gearsets are available with ratios ranging from 2.83: 1 to .760: 1 (six to 22 mph per thousand rpm with the standard 165-15 Dunlop SP tires). The gearbox selector pattern is artfully arranged with a normal four-speed H-pattern at center right; starting and reverse gears are to the left, beyond a springloaded detent. Reverse (forward) has an additional detent (down), so it takes the novice some time to get moving astern. The dashboard (in black wrinkle-finish fiberglass) is unusually complete with instruments and controls. Centered in the nacelle is a 9000 rpm tach flanked by a 280 kmh (190 mph) speedometer on the right and a combination oil pressure/oil temperature/fuel gauge on the left. Various warning lights tell the driver if the heater is off, the generator is kaputt, the high beams are on, the parking lights are on, or if the turn-indicator blinkers are on. Two stalks on either side of the steering column control the horn, headlight dimmers, directional lights and auxiliary driving lights. There's a push-button windshield washer and an absolutely enormous truck-type single-blade windshield wiper with a "pantograph" strut to keep the blade vertical as it sweeps through its wide swath. The molded foam rubber seats are stationary while the pedals and steering column are adjustable, like Ford's original (rear-engined) Mustang. With the pedals in their forward-most of the three positions, von Hanstein could neither fully declutch nor achieve maximum braking, as we found out to our horror at the first turn outside the factory gate. This has long since been corrected on the production 904s-we obtained one of the 105 examples that have been built as of this writing, to ascertain this and to better our acceleration figures - but heel and toeing in the old prototype was difficult for a six-foot-two driver. A variety of optional-sized seats are available for production 904s to suit drivers of various girths and give enough headroom for up-to six footers. The seats, covered in blue felt, simply "plug in" to the recesses molded in the back of the cockpit. The interior, as drab as a Populist meeting hall, is surprisingly comfortable (for the driver; the passenger's right foot loses out to a battery box) even liveable for a trip of, say, six hours. There's even a shelf to brace the left foot while whistling around corners. Ze enchine, I was told, ist chust an oldt Carrerra mohton', vis only 130 horrses. 1st much betterr vis toolitah 180 horsepowerr rracing enchine. Oh sure, only 130 bhp. It didn't seem hardly enough to do any more than pool all our blood along our jellied spine, break our glasses across the bridge of our nose and leave the impression of our belt buckle on our stomach. Von Hanstein was winding it out so quickly in each of the ultra-close ratio gears that we hardly noticed that we were doing 100 mph only three blocks from the factory. By the time we had taken that in, we were already turning 7000 in fifth and well out of town. "You're sure President Johnson does this?" we croaked weakly. fishtailing. . . and the factory drivers love to demonstrate this to unsuspecting Timid Souls. Lean, needless to say, is imperceptible. After scaring the living hubris out of us, v. H. gave us the wheel. Fully expecting to stall it dead on the first try, we revved the engine wildly and cautiously eased out the clutch. Just when we thought it wasn't in gear after all, the clutch bit like a steam catapult, the revs dropped to near zero and we were off in a series of jerks and chirps from the Dunlops. The so-called flywheel is about as thick as the ham in a drug store sandwich, so the revs fall off sharply between shifts-and the tires squeak again. It was only when we got driving the little monster like a full house competition Corvette-slamming the shift through the gate as fast as our palsied hand could move - that things simmered down and smoothed out. But not even a drag Corvette would run out of revs so quickly in each gear. Although the 904 is not comparable to Pontiac's GTO, it's noteworthy that the Porsche with its long "Le Mans" gearing is only 4/10-second slower to 100 mph than the Pontiac geared to turn 115-mph quarters. Our wooly exuberance evidently got the better of von Hanstein so we dropped him off at the factory and set out alone for the open reaches of the Solitude circuit, which the GP boys lap at something over 100 mph. It's a lovely and dangerous circuit lined with trees, a couple of hotels and restaurants, ditches, some fencing, poles and Germans. On public roads, its only closed to traffic on race days. The rest of the time, all kinds of native traffic is tearing around in both directions trying to prove something-skill, masculinity, lack of guilt in starting the last war or lack of responsibility in having lost everyone since 1870. At any rate, in the hairpin turns we discovered the expected: the cornering power is fantastic. The tires just lock into the road surface and push the car against seemingly infinite amounts of centrifugal force. In the faster turns we were initially over-cautious. When at last we gave the beast its head, we learned what all those theoretical discussions about a "low polar moment of inertia" added up to-when you lose it, you lose it faster than the reflexes can follow. The factory test drivers later told us you can't hang the tail out on a fast bend; you track it around like a GP car or you are too slow. . . or you spin. With almost all the weight of the car within the wheelbase, it breaks loose as quickly as a broom balanced on your palm. . . with the straw end down. Not that it can't be done; the correction must be quick, sure, and metered out in exact amounts at the right time. The rearward visibility is excellent-much better than one would expect, and better than a pre-1957 Volkswagen, for instance. It suffers only in the left rear quarter where a triangular piece of fiberglass fairing cuts off the view of who's passing you. Not bloody likely. Side and forward vision are as good as, or better than, the late lamented Speedster. The big question in our mind, and perhaps in those of our readers, was: could this untamed beast find happiness as a pampered street car? (We were ready to start signing over all our travelers' checks. . . as a down payment.) The answer is yes-a highly qualified yes. It could be used - for boulevard transportation, but the owner/driver would have to be slightly out of his mind. There are those among us who are going to go out and buy 904s anyway, detuned as little as possible, and tear around the countryside like maniacs. They won't be dissuaded by the awkwardness of getting in and out, by the expense of setting up and maintaining the four-cam engine, by the harsh ride, nor by the insufficient steering lock (several tries are needed to make a U-turn on a narrow street). No sir, they're utter fools, and we wish we were among them. On the other hand, as a competition car, it's an eminently practical and satisfactory choice. The SCCA recently classified the 904 as a class A Production car on the basis of its potential performance. By that standard it competes with the mighty Cobra. By the FIA's international classification it's an under-two-liter car where its closest rival is the very fast, very fragile Abarth Due Mille ("2000"). The 904 is quick and strong enough to acquit itself well in any long distance event, and at $7425 (ex-works) it's a pretty cheap way to get into the Big Time. Double rail frame bonded to fiberglas body. bone and single lower arm) and coil springs, stabilizer bar.